Another week and another rockstar into our collection, our guest this week is a huge community-oriented Judge who consistently has been focusing his efforts on contributing to his local judge scene by supporting Judge dinners, conferences, and even paint-ball encounters! Do you want to have a trip into the Iberian lands? Or maybe read about a story of drug dealers taking domestic flights? Then don’t miss this interview with Jorge Almeida, the Catalonian manager from Barcelona, Spain! This is a good question, really, I can’t remember, maybe I started like many other judges, wanting to know the rules, performing customer service and so on. Now I have discovered many other things I like the program. Occupation: I work in a driving school, my degree is in industrial safety. 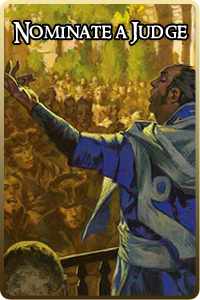 Least favourite card: Norin the Wary, …is true… is immortal! Favourite format: Modern and Khans Draft. Favourite non-Magic Game: Game of movies, you can play with any site, with anyone. Best tournament result: I’ve won a PTQ, made day 2 at PT Barcelona, top 96 in GP Antwerp and top 98 at GP Lyon, I also won a 2K at my LGS. I think it has improved my ability to coordinate teamwork, and manage conflicts. Digging into the Iberian archives, we found awesome stories about a Christmas Judge dinner and a paintball activities. How important you believe are these outside-event activities for the Judge Community? I think these activities are just so important to generate activity, and reinforce the team spirit in the community. In doing so we get a wonderful community, and their members become more active and this helps improve their skills and knowledge as a team. Any particular story about the paintball or the Christmas activity that you are willing to share with us? Sure! 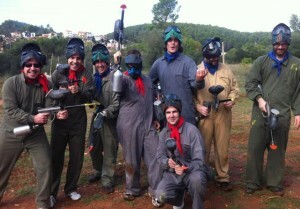 One of our paintball games was Lv1’s vs Lv2+. Twas an epic battle but the L1s were vanquished! It was such an Epic judge-on-judge encounter! For Christmas dinner judge, we sang karaoke, where Raul Rabionet , altered songs with humorous/hilarious lyrics all the night long! Proudest moment of your Judge life. I so have many moments to be proud of to be honest its hard to pick one over others. However if I had to pick I’d say a lot of my very proudest moments are related to dealing with challenges that impact your peers in a positive way that they become better people and recognize your hard work. The judge community is so important and gives so many possibilities to do so many things, take advantage of this! You can build something here. The only limitation is your voluntary commitment and desire of self-involvement in the community. Judge Conferences! They are always full of good times and fun, would be very difficult to pick one over the others =P! 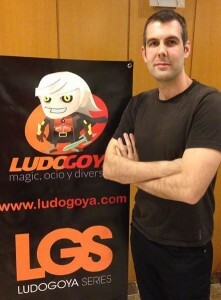 The last event where I had a great time was the weekend of Arkanis Deluxe, a event where we ran several events of all different formats the whole weekend, in Cantabria. The judge staff did a really great job, and I ended up exhausted. Some of the awesome judges we had on the crew were Sergio Perez , Maxim Antipov , Kepa Arrieta , Sergio Garcia , Antonio Jose Rodriguez Jimenez , Manuel Amaya González , and Nicolas Glik . Guys, you Rock! Well, I love to manage teams, the judge program has helped me a lot by developing these skills which also are huge in any another regular job. On the other hand becoming a judge compels me to be mature, fair, and an honest guy; these qualities are one of the makes you a happy and successful person. 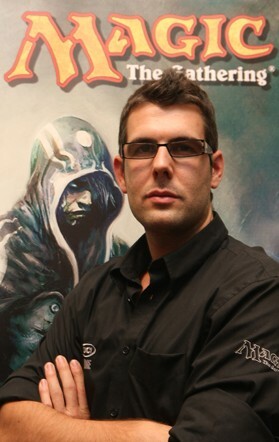 Maybe I would be attending some English lessons :D, Actually couldn’t imagine my life without Magic, I’m so involved in the game and is so much time I’ve enjoy both as player and Judge. I just love it! Nowadays I haven’t see many weird/unexplainable card interactions, but back then at the early days as I started to play I couldn’t explain how a man-land could turn into an actual creature with a Humility in play. Hey! 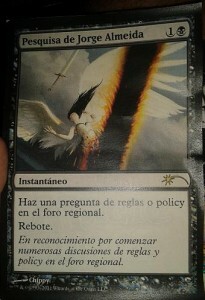 Did I mention that I’m a Planeswalker? 😀 *see picture! But wait, there is more! As I got to the gate trying to board the plane the air hostess explained me about the mismatch so I had to leave the queue even when all of the other personal info were fine (ID number, day of birth, DCI numb-.. Ok, that didn’t, but you get the idea). As I was leaving my complain at the reception desk, I got intercepted by a couple of agents who asked me about where and why I was flying… well apparently Jorge Valdés is a wide known Cartel Coke Lead! If you were a creature, what would be you? 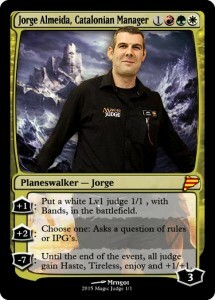 Obviously… Judgegoyf!! All judges get + 1/+ 1 for each judge on the floor. 1. Although this interview never mentioned it I’m also a passionate dancer. 2. While I’m Spaniard, I’m also a fluent English speaker solely thanks to the judge program! 3. One of my favorite Magic characters is Ajani, he reminds me of the value of valor, teamwork and trustworthiness. April has not actually wandered aimlessly about Japan, but ask about that roller derby at your next event with her! Thanks Jorge, its always a pleasure to hear about the awesome Iberian community, your contributions have certainly been a huge contribution to this! Judges, don’t forget to follow us next week in 7 Days! Nominate a Judge TODAY!